I made a mistake today. Actually, I made it days ago and didn’t even realize it, but got called out on it today (as was deserved). It wasn’t a big mistake. Hardly the end of the world. Not even a tiny world living inside an amoeba. Normal people would apologize, fix it and move on. I am not normal people. Not by a long shot. I did apologize and fix it. The moving on part? Not so much. I cried. I considered sending everyone I accidentally slighted fruit baskets. I considered how crazy that is. I got in my car and went to the grocery store (NOT for fruit baskets, for iced tea, which we drink like it IS the end of the world). Once I got to the store, I was still obsessing over my mistake and completely forgot why I was there. 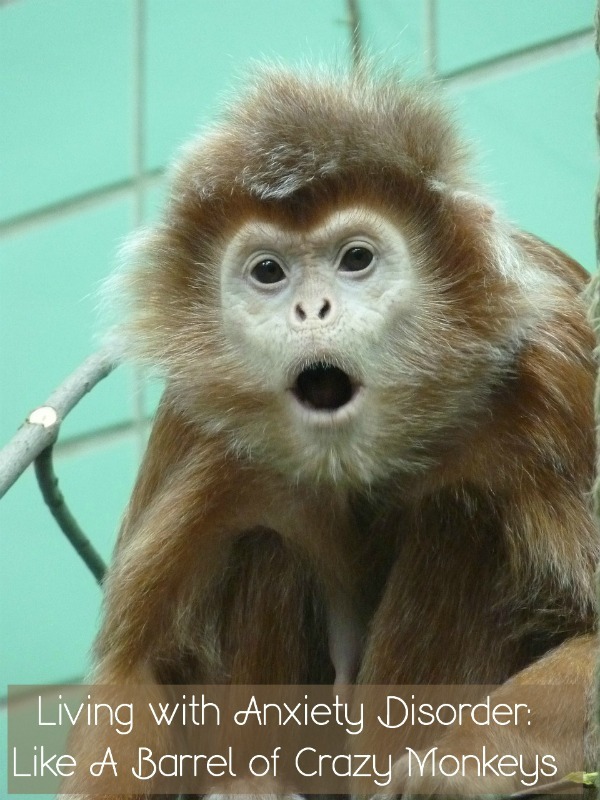 I stood in the middle of the produce department, looking like a deer in headlights, panic rising in my throat. I almost cried again. Then I remembered: tea, milk, cat treats, dinner for Jake. Adrenaline on overdrive from a hair-trigger fight or flight response, I managed to get what I needed and get home. That’s when I decided to write this post. First, let me say, this isn’t a woe-is-me post. I’m not looking for sympathy. I’m hardly the only person in the world with issues. 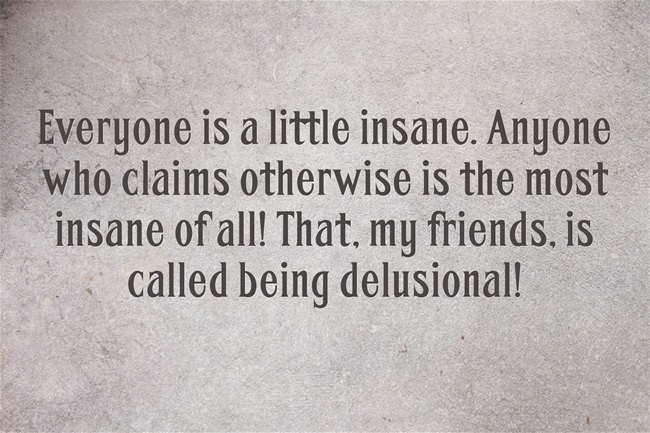 Everyone is a little insane. Anyone who claims otherwise is the most insane of all! That, my friends, is called being delusional! I just figure maybe if someone else out there has the same issues, they’ll feel a little better knowing they’re not alone. When you have anxiety disorder, you don’t just have a hair-trigger fight or flight response, you also have this insane notion that you should ALWAYS be perfect. Always get everything right. NEVER make a mistake. If you do make a mistake, fix it before anyone notices. If they do notice? END OF THE WORLD. I thought it was just me. I thought I was a total freak for feeling guilty over ever single mistake I ever made- big or small- for all of eternity. My therapist told me I’m not a total freak. I think she has to say that, but in this case, she’s referring to the fact that this is part of anxiety disorder. Apparently, I am a freak in the sense that I’m a control freak. Just like I have a hard time saying “no” to people or delegating things to others, I also have a sense that if I don’t do everything right, something bad will happen. So I’m normal…for someone with anxiety disorder. The main part of anxiety disorder is living in a constant state of fight or flight. Everything from a minor mistake to a major tragic event causes my sympathetic nervous system to go into overdrive. I’d say 99.9% of the time, I choose flight. Duck and cover, baby. I literally used to hide in the bathroom when I couldn’t deal with something. As a pre-teen and teenager, I’d lock myself in there and scream in frustration because I didn’t know what else to do. Back then, I didn’t know I had anxiety disorder. I would just scream, cry and generally freak everyone out until whatever upset me was out of my system. I think everyone thought I was just a brat. I’d think I was a brat too if I didn’t understand better. Anxiety disorder isn’t all bad, I guess. When I took Abnormal Psych in college, my professor told me that some researchers believe that it’s a left-over bit of genetic coding from the days when we had to outrun saber tooth tigers and whatnot. So if dinosaurs attack or the zombie apocalypse happens, I’m actually MORE likely to survive than “normal” people. Take that! I’ve been dealing with anxiety disorder most of my life, so I really don’t know what it’s like to be “normal” anyway. I think being a little crazy has made me a better writer and a better person overall. I’m very careful with other people’s feelings. I know what it’s like to be” over-sensitive” or “thin-skinned.” I truly treat others as I want to be treated. I want to be someone who helps build others up, not tear them down. I have a deep level of empathy and sense of loyalty. I don’t know if I would be that way if I was one of those people who wasn’t scared of anything. So while I don’t love living with anxiety disorder, I’d be afraid that wiping it out would also wipe out my better qualities. What about you? We all have our own issues, do you have any that you think make you a better person, even if they’re not fun to live with all the time? I can imagine it’s very hard to live like this. I have a bit of OCD, and it drives me crazy sometimes (as I’m sure it does my hubby and daughter too). And BTW, NO ONE is normal…LOL! Me too, but with the weirdest stuff! Like, if I read a page in a book and skip the last word for some reason, it will drive me nuts until I go back and see what that last word was. I’m also OCD about regular things, like checking for fire hazards and what not, but I think everyone has a bit of that. You’re right, no one is “normal” lol! I am far from normal :).I have episodes of OCD over the craziest things I can not help it. Wow you are amazing. I can’t imagine living with this. you’re inspiring. I have a lot of anxiety, but have never been officially diagnosed with anything. I just panic a lot and things like that. I have a little bit of that! I’m more of a perfectionist, I think, which can make me very hard to live with LOL I do get panic attacks from time to time – I HATE those things! I have anxiety and think that it is wonderful that you are willing to write about it. More awareness needs to be spread to anxiety disorders. Thank you! I’m sorry that you deal with it too. I’m pretty open about it (and any other issues I may have) because I really want others to know they’re not alone, or to help those in our lives us understand better. I have anxiety disorder along with manic reoccuring depression, PTSD, ADHD, and panic attacks. Oh fun, right? I have been living with these problems for so long now I like to tell people I have learned to live with them. What more can you tell them? But, its not really true because every new change or experience triggers something and I have severe flight or fight response. It got so bad once it caused me to move across the US. I know what you mean, about the “learned to live with it” part. I recently had a traumatic experience and was diagnosed with PTSD. It stinks because I’m not even allowed to talk about it much in a public forum, because of a pending lawsuit. So my one way of getting things out is pretty much off limits. How do you handle the PTSD? Do you have any recommendations? Thanks for providing really riveting insight. A lot of people don’t really know what it’s like to deal with anxiety issues. I’ve developed some of my own over the past few years and still struggle at times to deal with them. That was interesting. Thank you for the good info. I suffer from depression and it doesn’t always make me into the happiest of people to be around. I struggle daily on being a better person and if you don’t know it can be a struggle sometimes ot be around me. I suffered from adolescent-onset clinical depression for years. I managed to get it under control more or less, but I still have bouts. Summer is usually the worst for me, I have reverse SAD, because I do everything backwards! Happy in the winter, sad in the summer. Crazy? My mother has always suffered from anxiety so I know the hardships associated with it. It’s a very real disease. Anxiety is so hard. I have a panic anxiety disorder that can make life really tough. I get 60% disability because of how crippling it can be. I always find it so hard to explain it to people because it doesn’t make sense to so many people who have never lived it. I agree, it is really hard to explain it to someone who hasn’t lived it. I think the panic part is the worst. When I have an anxiety attack, it’s usually over something real. Maybe not something most people would get upset about, but it’s real. Panic, that seems to just come out of the blue for no reason at all sometimes! Anxiety can be very hard to live with for sure. Fortunately there are professional out there to give guidance and for some, medications work wonderfully. I think that one of my kids suffer with anxiety problems. I think we all have a little bit of some level. I have my own issues in that I tend to beat myself up for every little mistake. I have post traumatic stress disorder and ADHD survival is huge in my life I endured so much and I also live with 22q a rare genetic disorder as does my daughter. I totally get the understanding others and being empathic towards someone else who is going though a tough time. I too see a therapist and she likes to believe that everything is ok in my life and I’m doing amazing considering all I’ve gone though unless I tell you I have post traumatic stress you wouldn’t know it you totally can tell I have ADHD though there’s just no covering that up lol I believe my therapist believes everything is ok but I don’t believe it. I’m always waiting for the other shoe to drop. So sorry to hear about your anxiety. That is nothing to laugh about. I have a few friends who suffer with PTSD including myself and I can totally relate. Anxiety is difficult to deal with sometimes. Certain things really bother me and I find it hard to let go but realize that they shouldn’t really bother me and I need to move on. 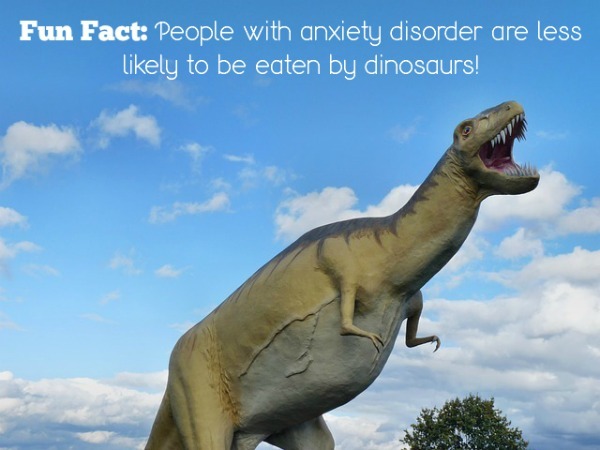 I also have anxiety disorder so I can totally relate! I too suffer from anxiety disorder and I could have written this post myself. It’s gotten way worse since having a baby 8 weeks ago, but I know that it will get better once my hormones even out and I’m clinging to that. Thank you for being so real and open with us. I love blogs like that. I think there are more people suffering from anxiety than we could ever imagine. It’s totally normal! I can’t imagine what it’s like to go through your days in your shoes. You sound like you have a lot of strength that helps you get through though. I had a bout of depression & anxiety quite a few years ago. I remember crying for three days over something so little. Nobody really understood either. I get ya. I guess a lot of people understand. On the bright side I will read this every time I get my old familiar feelings. I think everyone has a certain issue (I can relate to several things you mentioned). It reminds me of an old Laverne and Shirley episode where everyone at the brewery was freaking out because of these psychological tests they had to take, and they were obsessing over the doctor’s findings. Squiggy replied, “Look at me, I’m absolutely normal. Or, as the doctor called it, ab normal.” It resonates with me, what can I say? I do have anxiety also, and I find the older I get the worse it is. I wish I could let go of some anxiety and I do try to control it whenever possible. One good thing is that you do realize you have an anxiety disorder, and are able to get therapy. Because i can imagine how anxiety producing it would be to have all these feelings and not realize why, which would compound everything. We live in a society that everything is fast and over complicated, rewards risk taking, etc. I like to live simply and quietly as I can, that isn’t easy. I don’t know much about anxiety disorder, but I appreciate your post b/c I want to be aware more of what other people go through on a daily basis.